Partners for Health has kicked off a year-long campaign to raise awareness about suburban hunger and inspire action that will help nourish our neighbors who struggle to afford healthy food. The grant-making foundation developed the Fight Hunger the Healthy Way campaign to put an emphasis on donations of healthy foods to emergency feeding programs as part of its mission to promote health and wellness in the community. Partners for Health executive director, Pam Scott, says that efforts by schools, congregations, sports teams and youth clubs will increase the amount of nutritious options available for those who need it the most. The community garden initiative, A Lot to Grow, a key partner in this effort, is an example of people coming together to make a difference. Founder Patrice Kelly became concerned at the beginning of this Recession five years ago about access to fresh produce for people who were struggling. Today, ALTG volunteers grow fresh vegetables in five local gardens that are then donated to soup kitchens, food pantries and senior citizen facilities located in Montclair, Bloomfield, Glen Ridge and Nutley. Since 2010, more than 3,500 pounds of vegetables and herbs have been donated. Volunteers say that in addition to helping fight local hunger, they receive great benefits: physical work in the garden; social interaction with people from different backgrounds; and even knowledge to apply to their own backyard gardens. “Our gardens are volunteer-driven, and 100% of the produce goes to persons in need,” said Kelly. 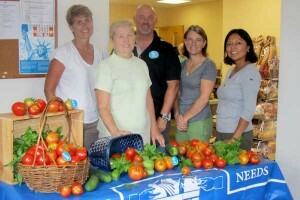 All types of donations, from garden initiatives to one-off food drives that bring in quality food are welcomed at the HNFP, where Bruno said pounds of food they have distributed has risen by 55 percent over five years, and the demand continues to rise.